Content Marketing is a concept that has been around for a while now. At its essence, content marketing is sharing your thought leadership and educating your prospects through your online channels so that by the time they are ready to make a decision to make a purchase or do business, they choose you. SEO (search engine optimization) is another must in the online business world if you want to be found. As a writer and marketer, it thrills me to no end that the current status of SEO has a lot to do with creating engaging and helpful content. I recently attended a seminar hosted by the Philadelphia Public Relations Association and presented by representatives of of Seer Interactive and SEOM Interactive where they shared current best SEO practices to the PR pros in attendance, including how to use your content to increase your SEO results. Read all about it in this recap I wrote for the Solo PR Pro blog. 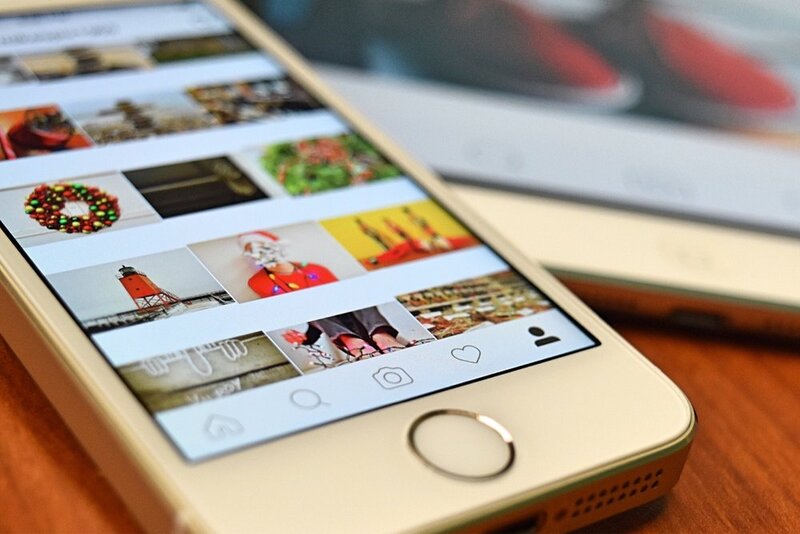 Are you increasing your use of Instagram for business? (Hint: you should.) And now you can follow specific hashtags. Doing so can amp up your listening campaigns and help you determine the best hashtags to reach your target audience. Get the complete scoop from Social Media Today. Are you using video to the advantage of your small business? Does the idea of using video to promote your business sound intimidating? While you do want anything you present about your business to be of good quality, you can use video without breaking your budget. By starting with simple educational videos to allow potential customers to have their first experience in dealing with you, you're well on your way toward accomplishing the goals of know, like and trust. Facebook recently published these 10 Tips on getting the most out of sharing your videos via their popular social media channel. Stay tuned for an update on our VoiceMatters' clients are using video to generate new leads and strengthen existing customer relationships. Reaching customers via all five of our senses - taste, touch, sight, sound and smell - brings to mind old school gimmicks like Smell-O-Vision. This snippet of a podcast by "Hooked" author Nir Eyal speaks to the "almost psychologist" in me. Fascinated by what motivates human behavior, I began my college studies as a psychology major. In the end I realized my strengths were writing and communicating, and I changed majors. It was all helpful, as a good understanding of what makes us tick also makes for effective marketing. In this segment, Eyal talks about the "user's itch," the internal need that compels someone to click Facebook over Twitter, or post a photo to Instagram rather than Pinterest. It's an excellent reminder to think more deeply about the user experience. Listen to the full podcast here (track #4). Twitter came up in conversation at this morning's meeting of the Indian Valley Chamber of Commerce's Marketing & Membership committees, leading me to realize that I never got around to uploading slides from my recent seminar on Twitter for Business. Let me correct that error now, reiterating that Twitter is a terrific tool for networking and learning. 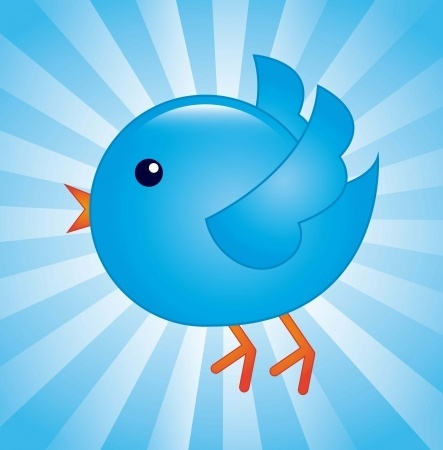 If you have any questions or would like to talk to me some more about Twitter and its role in growing your business, please connect! Do you struggle with blogging? Is it a time thing? A lack of ideas? Or, as Mark Schaefer so smartly points out in this slideshare presentation, is it a matter of confidence? Yes, Facebook is once again making changes affecting how your brand's posts are viewed in the Newsfeed. 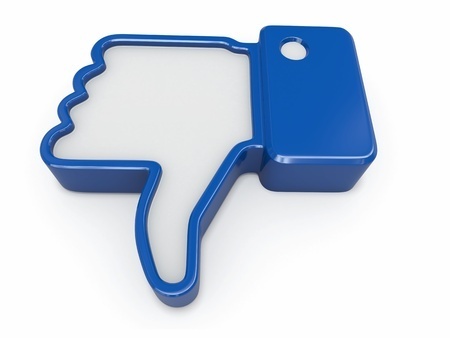 Starting in January 2015, posts that are solely or too promotional in nature will be seen far less by Facebook users. Hopefully you've been shying away from this kind of content anyway, given that within this year Facebook has been adjusting their algorithm to both monetize (aka decrease your organic reach to the point where you're willing to pay to boost posts and/or create ads) and encourage posts that include value for the consumer. While the initial reaction is to moan about yet another Facebook algorithm change, is this such a bad thing? Not if you're already following a good content marketing strategy of being helpful and sharing information that is valuable to your audience. Does this mean if you share any promotional content, it'll be invisible? Of course not. But you might need to put some money behind it, or make sure the news of your promotion is included within a broader context of the value of your business. One of my clients has great success with contest-themed posts, but they are created to be of interest to the customer base. When I experimented with a similar contest on another client's page, it fell flat. Why? It wasn't as relevant to the people who liked their page. Brands should already be considering Facebook as a monetized platform rather than a home base. Given the ability to target your audience with precision - and even have decent results with as little as a $5 boost depending on your goals - this could be a welcome change to your content marketing strategy. Above all else, brands should remember the social in social media. Be helpful. Create community. Be of value before someone needs your service and guess what? You'll be on their mind when they're ready to use your services. I confess. I might have a Twitter problem. I'm one of those "two-screeners" watching the Phillies game, the Oscars, or the latest episode of The Good Wife, glancing occasionally at my Twitter stream to see who else might be sharing the experience. I also firmly believe that Twitter works for building business relationships - from networking to customer service. Ann Handley's recent experience with JetBlue proves that Twitter can be a mechanism to provide exceptional customer service. Read all about it here in her post, Twitter Helps Me Get My Lost Book Back, and What You Can Learn from It. Why Work with a Solo Communications Consultant? 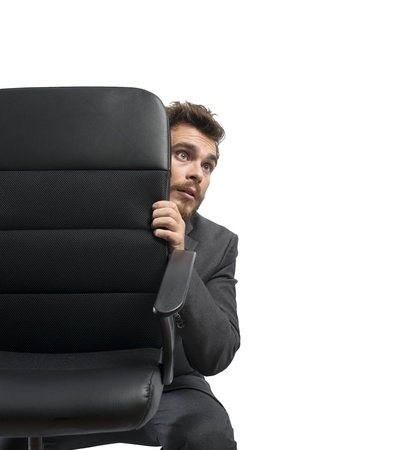 Working as a solo communications professional has its challenges, like any other career. Sometimes, the challenge is to help potential customers understand that just because your consultancy is run by one person, it doesn't mean that their needs won't be met. In my case, I pull together a team that suits the needs of the client's project. The process is the same as when I was an advertising account executive or directing non-profit communications - determine the needs of the project and assemble the appropriate team. I have web developers, printers, writers and graphic designers within my network to provide the same experience and solid results for my clients. It looks like I'm not alone in my solo consulting world. Kellye Crane of Solo PR Pro points to a new study by MBO Partners on the State of Independence in America, which finds that the solo work force is here to stay and is growing each year. Read her full recap here. Solo consultants are often seasoned, savvy professionals who are more than prepared to partner with you to achieve your business goals. As you look toward planning for 2015, what are your marketing/communications/PR goals? Want some help looking at where you've been and the progress you want to make in the coming year? Contact me - I'd love to learn more about your business and how we can achieve results together. Social media is how you can take your content marketing – a blog post, a webinar, a white paper, a video, a contest, hosted event – and deliver it to a relevant and willing audience. Instagram has just unveiled a new feature - Hyperlapse. It will allow Instagram users to shoot a video using their mobile device's camera and upload to Instagram. The Hyperlapse feature is currently available only on iOs. It is expected to be available on the Android platform "soon" and there are no current plans for Windows phones. Using clever algorithm processing, the app makes it easy to use your phone to create tracking shots and fast, time-lapse videos that look as if they’re shot by Scorsese or Michael Mann. What was once only possible with a Steadicam or a $15,000 tracking rig is now possible on your iPhone, for free. Imagine the possibilities for creating content to promote your business. You've seen them. The short headlines designed to intrigue you, encourage you, sometimes even scare you into clicking the link to read the whole story followed by the disappointment of not much "there" there. Similar to the sensationalized local broadcast news teasers - "You won't believe what vegetable causes belly fat!" Or "If you have this in your home, you could already be in trouble." - these "made you look!" headlines are known as "click-bait." Facebook is once again adjusting the newsfeed algorithm to discourage this practice in favor of content that people actually spend time engaging with and will be measured by time spent reading the content as well as how many people "like" or share the content. While the general consensus can be to groan about yet another Facebook newsfeed change, this one has the potential to improve the quality of your newsfeed. For businesses using Facebook as part of their social media strategy, it reaffirms the overarching strategy of attracting new business and retaining customers by establishing trust and being helpful. Be the answer to your customer's question. You can read more about this newsfeed change here or reach out to us, we'll be happy to help you strengthen you business' message and customer relationships. Happy Independence Day, Small Business Owner! Well, ok, I'll wish a Happy Independence Day to all of us in the United States, but a special "independence day" to those of us who have embraced the all-American spirit of can-do and started a small business. According to a recent study by Manta, small business success is on the rise and 72% of small business owners are happier with the freedom being the boss provides, even if 21% did acknowledge that they also carry more responsibility and less independence as a result. As the infographic below shows, two of the largest barriers to small business success are economic conditions and marketing to find new customers. I started my small business providing integrated marketing services and public relations to meet the needs of the small business owner who knows marketing is essential to success, but that hiring an employee or creating an in-house department doesn't fit the budget. Let's talk about how we can help each other banish these barriers to small business ownership freedom and make every day Independence Day. Summer is finally here. This usually means trips to the farmer's market and refrigerators stocked full of fresh produce from local farmers. You have everything you need to create a delicious summer menu. This may sound strange, but finding fresh content to share on your blog and social media channels isn't all that different. Even when the big sale is over or that long-term project is complete, there's always something to talk about via everyday occurences and items all around you. Take a moment and look around your office or your store. 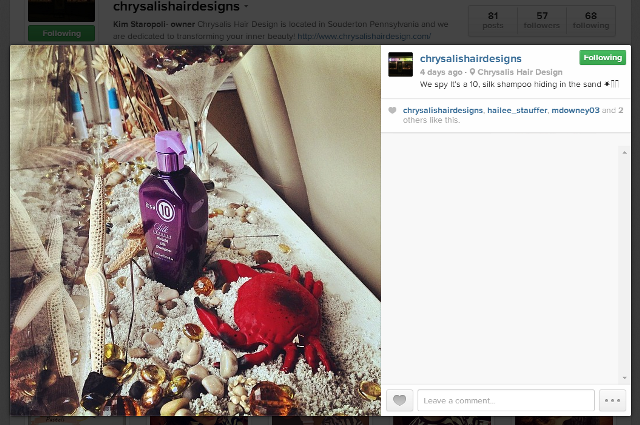 When was the last time you shared a photo or talked about the benefits of one of your products? Or when was the last time you shared a slice of office life? Maybe it's something you're working on today. Are you using summertime to plan for the fall? Talk about it. What do you customers have to look forward to? 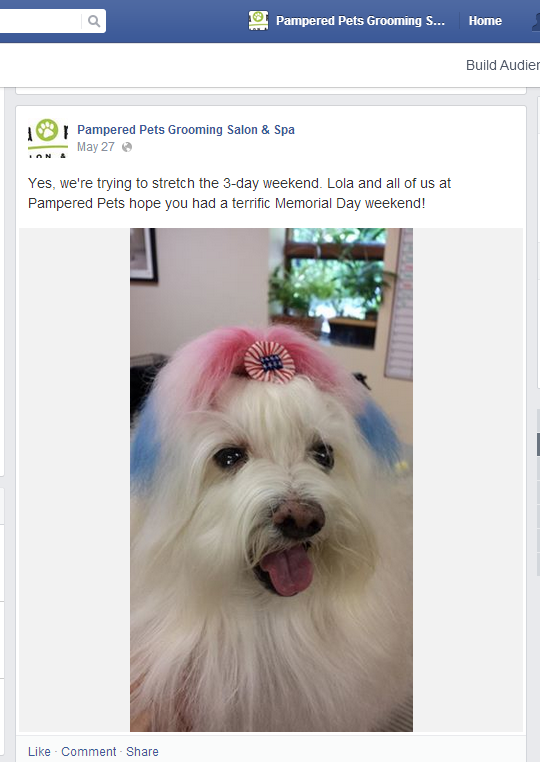 Pampered Pets Grooming Salon and Spa is another example of how sharing the everyday activity of your business can yield solid results. Here's another happy four-legged customer. This sharing of content isn't random, it's a strategy in and of itself. The more your customers and prospective clients see from and about you, the more they will likely trust you, remember you, refer you, do business with you. Take a moment out of your day and tell your audience what's going on. If doing so on an ongoing, consistent basis sounds like one more thing you'd rather not handle, we've love to talk to you. Reach out via email to info@voicemattersllc.com or give us a call at 267-236-3607. It would be wrong to close the week without ringing the new client bell! It's a pleasure to announce that VoiceMatters, LLC will be working with East Greenville's very popular The Grand Theater in promoting their Silent Film Series featuring live accompaniment via their historic 1923 Marr & Colton 2/7 Theater Organ! 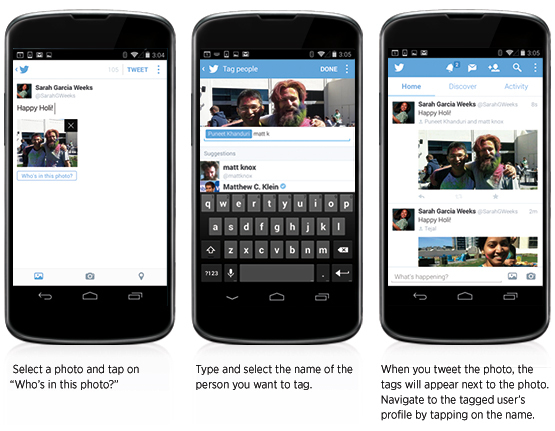 Twitter announced yesterday that users can now tag Twitter users and add up to four photos within a single tweet. A move that could be interpreted as an answer to Facebook's recent acquisition of Instagram, this new Twitter feature allows you to tag up to 10 people in a tweet without sacrificing precious 140 character space. You will also receive a notification each time you are tagged - yet another reason to check your Twitter account, no doubt. With Twitter's new feature, tagging up to 10 Twitter users & adding up to 4 photos to a single tweet is now possible. This feature is currently available on the Twitter iOS and Android mobile app. According to Techcrunch.com, Twitter has indicated also eventually bringing this to the web and allowing the feature to be used in third party Twitter apps, good news to those of us who use the many available options such as Tweetdeck, TweetCaster, Hootsuite, etc. What do you think of this new feature? If you're not yet on Twitter, will it lead you to try it? If you're already on Twitter, will it drive you to use the native app or will you wait for it to come to the third party apps?